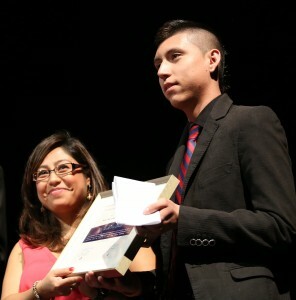 Cristina Jiménez, Managing Director at United We Dream, and UWD’s Antonio Alarcón with the ALBA/Puffin Award. 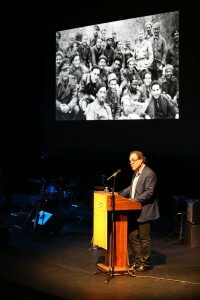 Filmmaker Oliver Stone, whose Untold History of the United States excited TV audiences last winter, added a chapter to his narrative in a moving encomium to the volunteers of the Abraham Lincoln Brigade in his keynote speech at the 77th annual reunion held at Pace University in New York on May 5 (video | pictures). And human rights was the dominant theme of the day’s program as ALBA joined the Puffin Foundation in bestowing the third ALBA/Puffin Award for Human Rights Activism to United We Dream (UWD), the largest network of youth-led immigrant activist organizations pushing for reform of immigration policy in the United States. 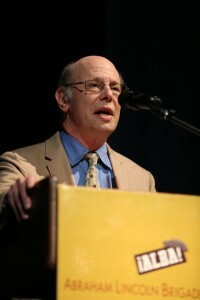 The award includes a $100,000 contribution to encourage the group’s activities to educate the public about the issues. Accepting the award on behalf of UWD, Cristina Jiménez and Antonio Alarcón described the problems facing undocumented immigrants that led them, despite great personal risks, to join the movement for change. Both stressed the importance of maximum public participation as the U.S. Congress approaches new legislation to address the issues related to immigration reforms. A musical quintet, led by Bernardo Palombo, performed three songs, including Woody Guthrie’s “Deportados,” as homage to the young people now in the vanguard of asserting the need for change in immigration policies. 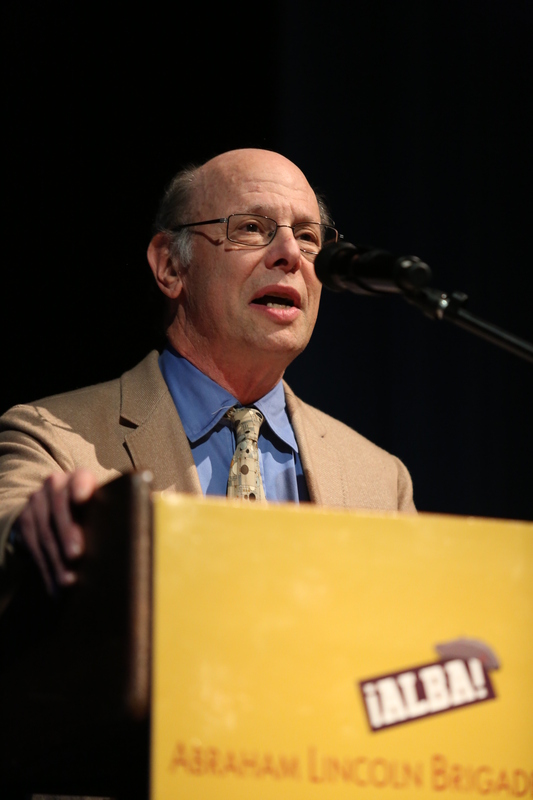 Palombo’s connection to the vets goes back decades; he performed the sound track for the documentary, The Good Fight. One noted absence—last year’s award winner Kate Doyle—only underscored the fact that the struggle for human rights continues on many fronts. Hoping to greet the UWD activists, she was called back to Guatemala to provide testimony in the trial of military leaders accused of the massacre of innocents. As several speakers mentioned, ALBA’s support of human rights activism continues the tradition of the Lincoln Brigade volunteers, many of whom were immigrants and children of immigrants, who stood up to defend democratic values in the face of their own government’s indifference. To see more pictures by Nicholas Chen, Shinsuke Higuchi, and Juan Salas, click here. A 15-minute video compilation is below. Videos of the complete speeches are here. ALBA 2013 NYC Event Video Compilation from Sebastiaan Faber on Vimeo. I’m a history major from Spain. I did a research on my freshmen year about international brigades and thats how I got to know about ALBA. Now im very involved in the historical memory actions in Spain. We just volunteered in an exhumation of a mass grave near my city. I think you could find it interesting. Its very impressive that international people and international press are interested in this topic. Its sad to see how nothing its being done in Spain nowadays and how these projects have to use crowdfunding to work. However, volunteers and people with a lot of enthusiasm and ideas are working on it. I was in NY a couple of months ago but I didnt manage to visit you and congratulate for such a good archive. Im sorry I didnt find any specific article in English.